I was really excited to try this as it stuck me as a fairly new idea. 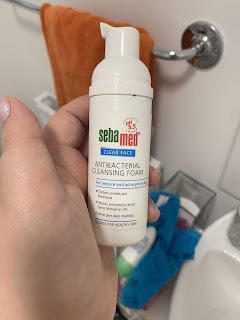 The cleanser is designed for acne prone skin, which I sadly suffer with. A little of this product goes along way. One pump would do the whole face so it lasted for a long time. When I applied, I instantly felt it working, with a slight tingle. I loved using a foam as it felt light on my skin. My face felt smooth and alot calmer - My skin can sometimes get sore and rashy so its good for sensitive skin. I really liked this pads, there were 28 which meant they lasted a month. 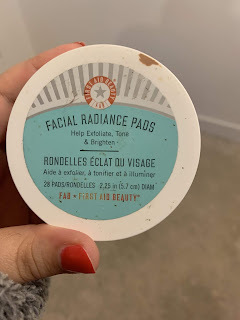 I used them after I cleansed my face as they are designed for daily exfoliation and toning. You can use them twice daily, but I used them in the evening as they were super handy to also take make up off with. I was worried that using a daily exfoliator would irritate my skin but it actually helped it alot. The pads are quite thin too so they are easy to dispose of. 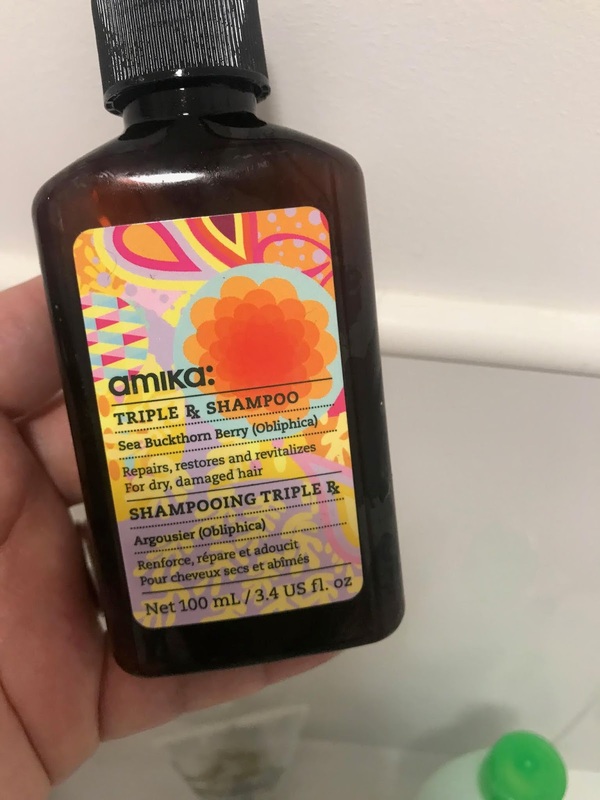 I plan to repurchase this product to make as part of my daily routine as it just makes it so easy and quick in the week! 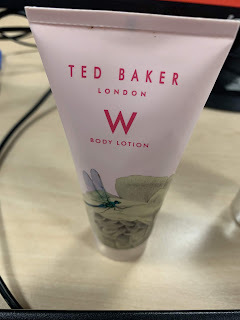 As with the Ted Baker lotion, due to the size of this one, I used this product at work. 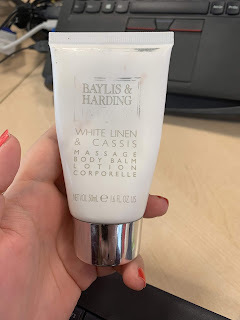 I used it as a hand lotion, but I did enjoy the massage element to it too. So its hard to describe, but picture both an Oil and a light lotion coming out in one squirt together. I would not use much and I would literally massage it into my hands. This was a lovely feeling as I used it during the winter, when my hands were at their most vulnerable. It did however make my hands a little sticky and a little slippery. 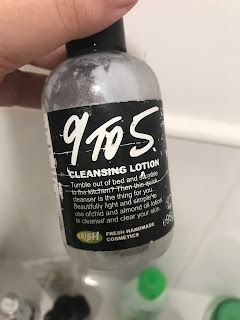 I loved the smell as it was so clean. I would consider a repurchase, but not to use as a hand cream, but instead as an actual body lotion. I got this as part of a gift set. Oh K! Bubble Sheet Mask & Percy & Reed's Totally TLC Hydrating Hair Mask. These two were actually my Christmas day treat to myself. In the middle of the afternoon, when Luke was having a snooze, I decided to treat myself to the two masks. It reminded me of my favourite lazy Sundays in which I would do both a Hair Mask and a Face Mask and feel incredible for the next week! 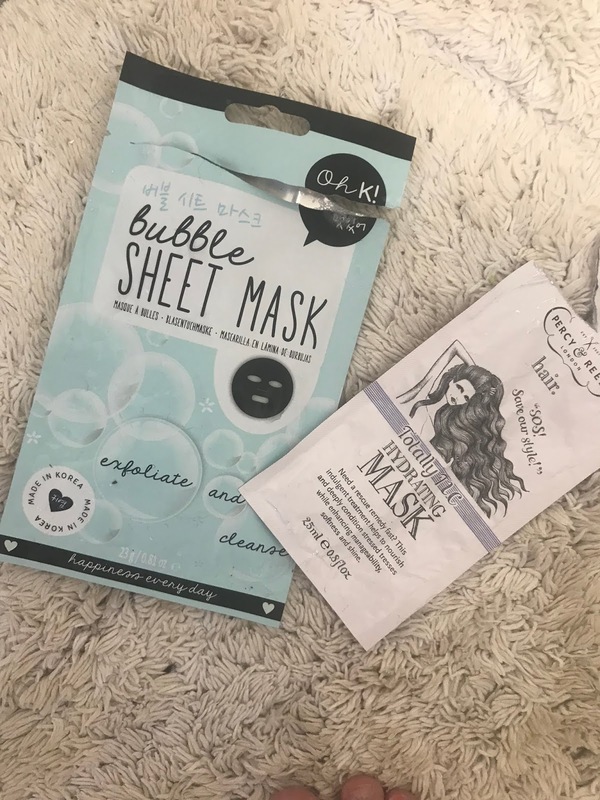 I did the Bubble Sheet Mask first as I knew that I needed to time how long it was on. 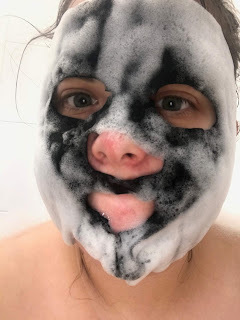 I had read online that these Mask's are incredible but they will just keep on bubbling if you didn't keep an eye on them! This was the Exfoliate and Cleanse Mask. This was after ten mins... please excuse the face, I accidentally swallowed some of it. My face was glowing after I took it off and so soft. I am definitely, going to repurchase a lot of these. I just have to clear out some of the ones I have. The hair mask did a great job and I knew it would before I even tried it. Percy and Reed have fast become one of my go tos for hair treats. My hair felt incredible and Luke said that it smelt really good. I always worry because my hair is so fine, that it will not react in the best way and look limp and greasy. But this brand seem to always get it right. I will definitely be repurchasing after I have used up my overnight recovery balm! I got both of these from Birchboxes. Again, as mentioned, I get really worried about trying Hair stuff. But, this shampoo was amazing and I again tried this for the first time on Christmas Day. I was immediately taken by the smell, as you can probably tell, smell is an important thing for me. I love that it felt so natural and that it is cruelty free. I still have other products to try from the range, so when they are used I will let you know what I think of them. I love this product, it just upsets me that I cannot get it from a local store and will have to order it online. I got this from one of my Marzia boxes. I have featured this product many times and I honestly love it. It can be used in the morning and in the evening and its great for removing makeup. Its not really got a scent which is ok, and its really soft on sensitive skin. As it comes from Lush it is natural and cruelty free. I have repurchased this product many times and will continue to do so! So thats it for now, I am going to try and do this post monthly instead of once in a blue moon. I have actually just had a reshuffle of my beauty products in the bathroom so I will let you know what I am loving next month! If you have any questions about any of the above product, then please drop me a comment!